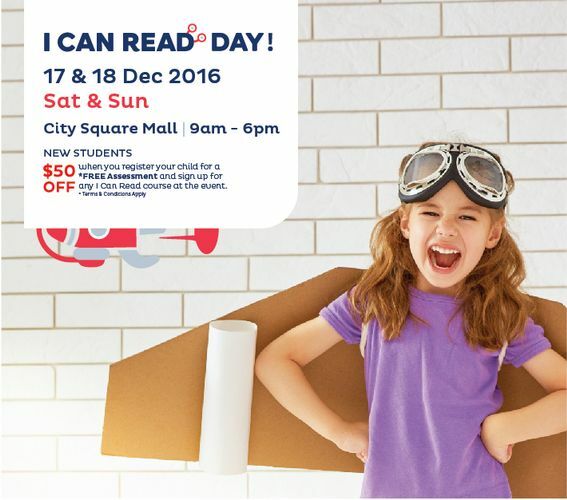 Join us from 9 am to 6 pm on 3 and 4 December, 2016 for a day of free assessments, free balloons, a colouring contest and discount vouchers towards any I Can Read Course! Our City Square Mall Centre is located at 180 Kitchener Road, #07-09, City Square Mall, S(208539) and can be reached at (65) 6509 4217. Parents can register for the event at bit.ly/icrcitysquare or by calling the centre directly.